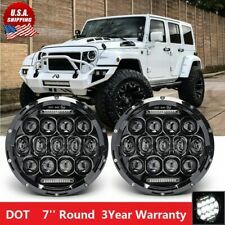 Specifications: Type: Jeep LED Headlight With DRL Watt: 85W Input: 12-24V DC Operating Voltage: 10-30V DC Luminous Flux: 4800 LM@high beam, 3200LM@low beam Connector: H4/H13 (Ground and High Beam) Housing Material: Aluminum Lens Pattern:High & Low Beam Package included: 2pcs headlight 2pcs H4 to H13 adapters. Jeep Wrangler TJ Unlimited / LJ (2003-2006). Jeep Wrangler TJ (1997-2006). Jeep Wrangler JK 2 Door (2007-2016). Jeep Wrangler JK 4 Door Unlimited (2007-2016). Halo Headlights (ColorfulLight). LED Quantity: 4(Pure White 6000K). 【Easy Wiring】Red Wire connected to DRL, Green Wire connected to Flow Turn Signal, Triangle Plug connected to Hi-Lo Beam. DRL & Low Beam adopt unique anti-glare Lens, not blinding coming traffic. 【Multiple Light Modes】Equipped with High Beam (4000LM/Pair)/ Low Beam (2000LM/Pair)/ DRL/ Flow Amber Turn Signal function. 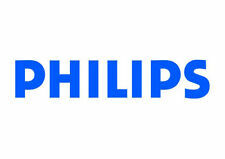 Exclusive dual D-shape lens contributes to best light shape,highest brightness,widest and longest light area. White Halo Ring. 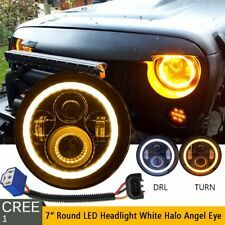 Built-in Halo Ring can be used as DRL/Angel Eye/Turn Signal. 2007-2017 Jeep Wrangler Unlimited JK 4 Door. 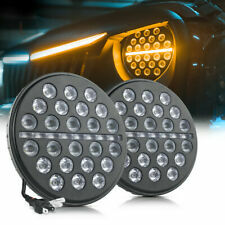 Headlight Bulb High Beam(1 pair/2 pcs). 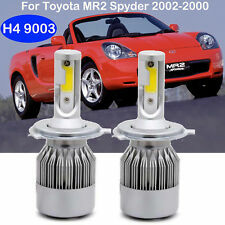 Headlight Bulb Low Beam(1 pair/2 pcs). 1989-2002 Land Rover Range Rover. Product: Headlight Bulb. Smaller size, suitable for 98% of vehicles, no need to worry about installation problems. "Hella Headlight --. HELLA HEADLIGHT. Therefore all implied warranties that may apply to your part are limited to the duration of this written warranty. Each warranty gives you specific rights, and you may have other rights which vary from state to state. Part Number: F90008. Established in 1959! We can provide minimal support, but we will try our best to help. Canada and International Countries. "Lucas Headlight Switch --. LUCAS HEADLIGHT SWITCH. Condition : New. Therefore all implied warranties that may apply to your part are limited to the duration of this written warranty. Each warranty gives you specific rights, and you may have other rights which vary from state to state. Include a pair of headlights. Color:Clear lens. Quality products with the best possible solution for your budget. Jeep Wrangler TJ (1997-2006). Jeep Wrangler TJ Unlimited / LJ (2003-2006). 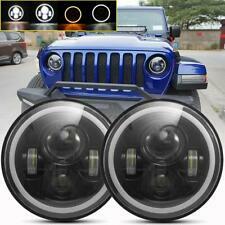 Jeep Wrangler LED Headlights Halo RGB Angel Eyes are made with the newest design creating unlimited color options and functions to customize your Jeep for an unique look! Free 1-5 Day Delivery with Hassle-Free 30-Day Returns! Defender 90. Range Rover Classic 87 - 95. 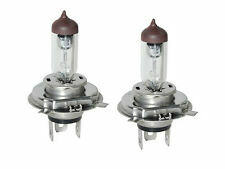 We have a New Front Head Lamp Light Sealed Beam 7" Set ( 2 pcs). We are Rover people. NOTE: Active DRL turns from white to amber when turn signaling! 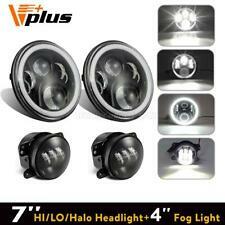 • Function: DRL Angel Eyes / Hi and Lo Dual Function. • Active DRL Turn Signal Color: Amber. 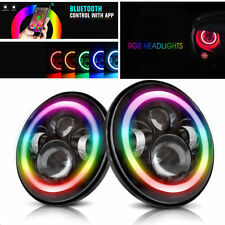 • Active DRL Color: White. 1997-2006 Jeep Wrangler (TJ).